Last night Showtime aired the 100th episode of its long-running hit Weeds. However, one of the show's most popular actors wasn't watching it when it was first shown since it was the middle of the night for him. Alexander Gould plays "Shane Botwin" on Weeds, a show about a middle class family from California that gets into the marijuana growing and distribution business after the head of the family suddenly dies. Over the course of the past eight seasons Gould's character has transitioned from a little boy to a young man before our eyes. He has shot a mountain lion, made a terrorist video in which he beheads a little girl, bit his opponent's foot in a karate match, murdered his mother's Mexican nemesis, lost his virginity, become a police officer, and stolen a gang banger's sports car. But that was just acting. 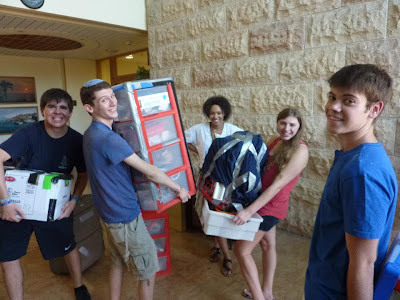 Alexander Gould (far right) moves into Beit Nativ with his USY peers. Now, he's putting his acting career aside for the year and is adjusting to life in Israel. While fans of the show watched last night as the Botwins returned to their roots in Agrestic, Alex Gould was sleeping in his bed at Beit Nativ in Jerusalem. 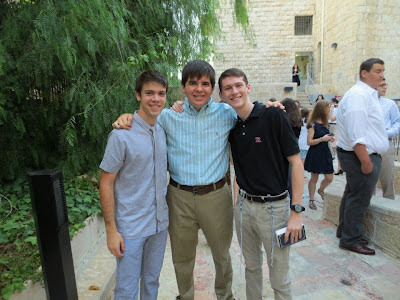 Gould is a participant on United Synagogue Youth (USY)'s gap year program called Nativ (Hebrew for "path"). Like other 18-year-old Nativers, Gould is studying in Jerusalem and will volunteer in other areas of Israel. He's currently studying at Hebrew University on Mt. Scopus (Nativers choose between the Hebrew U. track, an Ulpan -- intensive Hebrew language class -- or the Conservative Yeshiva). Early next year, he'll begin his community service project in Yerucham. Following Nativ, Gould will begin college at Clark University in the fall of 2013. Alexander Gould (far left) and fellow Nativers before Shabbat services. Gould made his acting debut at the age of six and gained worldwide acclaim as the voice of Nemo, the title character of Disney/Pixar's Finding Nemo animation. Before Weeds, Gould had several guest starring roles on television series like Ally McBeal, Malcolm in the Middle, Law and Order: SVU, Supernatural, and Pushing Daisies. He also was the voice of Bambi in the movie Bambi II and had a voice over role in Curious George. Gould has won awards for his voice over work and for his supporting role in Weeds. In 2007, he won Best Young Ensemble in a Feature Film for his role in How to Eat Fried Worms. While his co-star Justin Kirk has more of a Jewish themed role and has offered more Hebrew phrases during Weeds' eight seasons on Showtime, Gould screamed the first words of the "Shema Yisrael" during a karate match in an early episode. After spending the year in Israel and learning Hebrew, perhaps Gould will take on future roles in which Hebrew is required. Despite his busy acting and voice over career, Gould was an active member of USY, the Conservative Movement's youth group, during his high school years. That involvement led him to apply for the Nativ program. Rabbis and youth advisers who got to know Gould through his USY participation in the Far West region during the past few years report that he's a great, humble kid with a lot of friends and is very funny. For Gould, spending the year on Nativ with his Jewish peers is a welcome change from being home schooled as a Hollywood actor. While Weeds might not have caught on in Israel, it's still likely that Alexander Gould will be recognized in Jerusalem this year. Fortunately for his teachers at Hebrew University, Gould doesn't have the R-rated potty mouth of his TV persona.